Dream homes come in all shapes and sizes and when it comes to one’s log cabin dream home, there are certainly many options to choose from. Log cabins derive their beauty from the materials themselves as well as by the home’s breathtaking surroundings. Log Cabin style homes invoke the rustic and natural beauty of the wilderness and mountain environments while simultaneously bringing a sense of simplicity to the homeowner’s life. Many individuals choose to build their log cabin dream home as a vacation or getaway destination for friends and family. However, they later find themselves drawn to the comfort that is evoked by this home style. Log cabins maintain their beauty and only get more alluring as time passes. For this reason, they tend to stay within a family for generations. Building a log cabin home has become increasing popular for families everywhere. 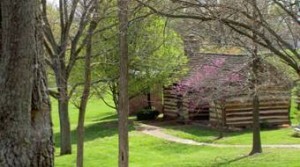 Log cabins have the ability to incorporate numerous appealing details in their design. They can include the most extravagant amenities or be minimalist for a cozy home feel. Here we offer you a glimpse into 7 amazing styles of floor plans for log cabins. We are almost certain one is sure to become your next dream home. Hybrid floor plans: This style encompasses the combination of log and timber elements within the building process. This design generally will require a more technically savvy plan that focuses on the engineering aspects of the home in order to successfully incorporate both log walls and timber framing. This is a creative and structurally sound style to consider when building your log house. Ranch house plans: Ranch style log home plans provide a sense of comfort and flexibility that is accompanied with the simplicity found in its traditional elements. This style allows you to incorporate tasteful elements like high ceilings while simultaneously having the option to have a simple, one story build. The ranch style usually incorporates a rectangular design or an L shape that is usually front-faced. This style also usually does not incorporate porches, but is an addition that can be made easily. This design is focused on utilizing all the interior livable space. Lodge-style log home plans: Lodge-style log cabin homes embody extravagance at its best. This floor plan style incorporates the alluring elements that are usually found in a luxury vacation lodge. The lodge style is ideal for beautifully crafted covered entries, large ceilings, and large windows for natural lighting. Traditional log home floor plans: This simple yet functional style basically speaks for itself. Traditional log home floor plans are minimalist, inviting, and appealing. This style focuses on the originality found in historical log cabin builds. This home plan is often where many begin their search when beginning to build a log cabin. The style is also completely flexible, should any additional elements be desired for the design. This style will both withstand the traditional and rustic log cabin feel with its interior and exterior aspects. Single story log cabin homes: Single story plans are perfect fit for large construction lots. This style allows for the interior space to be planned out as broadly as possible. A large lot is ideal for a single story plan, as it allows for fluidity in planning communal and private living space within the home. Multiple story log cabin homes: This plan allows one to be as creative as possible with interior space. Communal living space and private living space are more clearly delineated in multiple story cabin homes. This style also lends itself to unique building elements such as 1st and 2nd story decks which increase the appeal and value of the home. Prow style floor plans: This floor plan crafts both wood and glass to make for an eye-catching architectural statement that is both entertaining and beautiful as it incorporates the beauty found within the location. This style is ideal for homes that have panoramic views due to the glorious windowing that creates a wide-open feel inside while also creating a visually appealing exterior. No matter what your preference or style is, it isn’t hard to fall in love with one if not all of the many options and styles found in the intimate and welcoming style of the log cabin. From log cabin luxury home plans to simplistic cozy homes, we invite you to start your journey in creating a dream home that will last more than a life time. This entry was posted in Log Home Plans on May 20, 2014 by HouseplanGuy. You look at brochures and scour different sites online and think, wouldn’t it be great to live in a log cabin? Yes, it would… maybe. Yet there are a number of issues to investigate seriously to see if this romantic idea will be worth the hassle. Issues such as should you buy a pre-built or purchase log home plans and build from scratch. First, is it even feasible? Can you really live in a log cabin… unless you own real estate on a beach? The promotional brochure looks idyllic, and claims to be beautiful in any setting, but is a log home plan even functional? Is it really practical in a climate more than 10 degrees north of the equator? Aren’t you just asking to freeze to death? Secondly, what’s the purpose of your log cabin? A permanent residence or a vacation home? A couples’ getaway place or an alternate family gathering location? The answer to this question will determine the square footage needs of your log home plan and the quantity and quality of features to include in your design. At some point, one needs to ask the question, “How much money do I want to spend building a log home?” A large gathering place for your family as you and your children grow older may mean you are essentially building a second home, not a simple log cabin getaway. There is almost no agreement on the cost of building a log home versus a conventional home, some indicating it is less expensive and other identifying higher costs. Part of the reason for the cost debate is because one needs to understand what is and is not included in the package. Most log home builders provide a cost for a cabin’s shell as described in the log home plan. Yet cupboards, cabinets, closets, etc. are necessary for the home to be liveable and those are often additional to your basic price estimate. The type of roof, quantity and quality of extra features, windows and other accessories obviously affect the cost also. Finally, when it comes to the cost of a log home, while you may intend this to be the family gathering place for the next 50-100 years, you will pass off the scene and the next generations may wish to sell the cabin. Since you don’t know what will be trendy years down the road, the more unique features included in your log home plan, the more problematic it may be for resale value. Just because you didn’t need a “front door” but chose an open deck at the front of the house in 2012, doesn’t mean that will be appealing 50 or 75 years down the road to buyers. If there are a few of those quirky features, you might leave your family with some great memories but some awkward resale explanations. Log home plans can be a beautiful idea! A log home can be a one-of-a-kind, durable, energy efficient and environmentally friendly home for generations to come. Yet wisdom urges a person to thoughtfully consider a number of issues before investing in this picturesque venture. At Monster House Plans, we offer beautiful log home plans to consider for you and your family’s future! This entry was posted in Log Home Plans on August 14, 2013 by HouseplanGuy. When you think of a scene from a storybook, what do you think of? 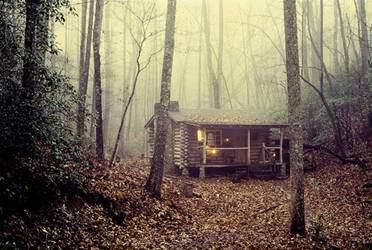 For many people, it seems that the image of a cottage or cabin nestled in the woods somewhere is what first pops into their mind. Often, this is a log cabin, rustic and beautiful with a charming atmosphere that both comforts a person and fills them with awe and mystery. This is a beautiful picture and one that can fill you with nostalgia about your childhood, a time when you were so transfixed and enchanted by stories like Little Red Riding Hood, and Hansel and Gretel that you wished you could be in them. Once you are an adult, it is hard to get that feeling back. But what if your home in real life was modeled after one of those log cabins? What if you could have the ideal blend of the novelty of a traditional cabin with the convenience of modern features inside? If this idea appeals to you, then it probably wouldn’t be a bad idea to look into modern day log home plans that could make this fantasy become a reality! Whether you live in an urban area of a city or own your own acreage miles away from any city life, the unique escapism you could feel living in a log home could be a priceless addition to your daily life. However, you wouldn’t want it to feel like too rustic of an experience either. You don’t want to feel like you are camping every day. Comfort is a major thing that one should look for in a home. Well, if the look of a traditional log cabin appeals to you, but you don’t want to have to worry about living in something shabby, then you no longer need to worry! With modern Log home Plans, you can design a state of the art living space. You might wonder how it works. Well, many modern day log home plans come in kits, which are already drawn, and include modern day conveniences. Through the use of these kits, you can create a home that is comfortable, efficient, and reflects your style, while still maintaining the novelty of having a rustic, log cabin-like appearance. Plus, you will save money on architectural fees because the plans are pre-designed anyway! The logs that are used to build the home are usually already grooved to accommodate electrical wiring. They will also protect your home from unruly weather and unwanted insects. You can even get log home plan financing if you so desire, making this a convenient and cost-efficient option for almost anyone! With log home plans, you are bound to be happy with the house you end up creating. Certainly, you won’t be the bitter and malicious villain of the fairy tale, but instead the prince or princess, happy in your enchanted throne, which can range in size from cabin-size to the size of a mountain lodge. If you want to stick with tradition, but give it a modern edge, then a log home plan from us is the right way to go for you! This entry was posted in Log Home Plans on June 20, 2013 by HouseplanGuy. Many people think of log homes as a sort of luxury item, and assume that all log home plans have to be big and elaborate. It is understandable how this mentality could have developed. Log homes are a bit of a rarity now as homeowner’s associations tend to limit anything that is aesthetically different or unique, and log homes might look a little out of place in most urban neighborhoods. However, it is important to remember that log homes weren’t always considered a luxury; in fact, they used to be considered the most basic and rustic type of home available! If you are interested in having a log home built, your log home plans don’t have to be large, sweeping, or dramatic. Your log home can be warm, cozy, and humble and still be beautiful. As quaint and rustic as a log home can look, the truth is that they can be fairly expensive to build. Nowadays, there are many types of siding and building materials that are cheap to manufacture, such as vinyl siding, making them cheaper than log homes. Because log homes are unique, there aren’t as many builders who have experience handling log home plans. Don’t let this discourage you from designing log home plans, though. Log homes are worth every dollar you spend on them. They are stable, sturdy, and absolutely breathtaking to look at. However, the cost might mean that you should be open to designing a slightly smaller log home. Sure, there are many people with huge, dramatic log homes, but that doesn’t mean yours has to be excessive. You won’t be happy with it if you go outside your budget and are stuck with an overwhelming expense. The interesting thing about log homes is that in many ways, they are more suited to a smaller size, so don’t worry if your log home plans aren’t massive. 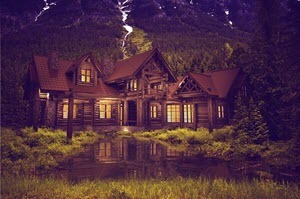 Log homes bring to mind warmth and comfort, and a certain rustic charm. Smaller log homes feel cozy and inviting, and pleasant and safe to be in. If you do choose to go with a larger log home, you should decide in advance how you want to decorate it. There will be a natural juxtaposition of styles between a large mansion and a rustic fabrication, so it might be a little tricky to come up with décor that feels natural, sincere, and fitting for the home. All it takes is a little thought and planning ahead of time, and no matter what size your log home is, it will be beautiful and truly feel like home. When working with log home plans, it’s important to remember not to cave in to how you feel it should look. Log homes, in every shape, size, location, and style, are a unique statement, and you shouldn’t let other people dictate how you go about designing and decorating your own. Make your log home unique comfortable, within your budget, and a happy place for you, your friends, and your family to gather together. That’s all you really need out of a home and you can make it happen – with our help of course! Many people end up deciding to build a home and pick from plans, but more and more are going with the log home plans because they really love all the features and traditional makeup of the log cabin home. Whether you are in the market for a new home for your primary living quarters or are searching for a dream vacation home for your family to enjoy for generations to come; a log home plan can be exactly what you are looking for. Modern day log home plans are very spacious and offer all of the amenities that we have come to expect, along with the beauty and characteristic features of a log home. Wouldn’t you love to wake up feeling as if you are surrounded by nature, but also feel the comforts provided by a log home plan? The beauty of the timbers and natural stone mesh together perfectly, just as they would in their natural environment. Most log home plans come in kits which are more cost effective and will save you on architectural expense. Whatever your desires are, a log home plan can fulfill your every need. For a smaller family of three or four, a log home floor plan of 1,500 to 2,500 square feet would more than meet your needs. Even more modest styles of log home plans have many amenities to choose from. A wrap-around porch or a screened in porch would be perfect to enjoy the kids playing joyfully on the lawn while you are sipping on your tea or lemonade. Your log home plan can even include a cozy fireplace for times during the cool weather or a grilling porch for entertaining family and friends. These charming additions to your log home plan, can allow you to further enjoy nature’s beauty in the comforts of your own home. If you are a larger family, or plan to use your home as a vacation home to gather many family groups together, a more extensive log home plan may be exactly what you are looking for. If your desire is to entertain large groups then it is great idea to look for plans that include recreation rooms, ample great rooms and open floor plans. Whether you require multiple bedrooms, or a few exquisite master suites, you will be able to find it all in the log home plans that are available to choose from. New advances in material preparations will ensure that your log home will be protected from insects and weather which will certainly enable you to enjoy the choice you made of log home plans without any pesky concerns. You will also get to choose your windows, doors, and roofing to personalize your log home further. Log homes are very durable and will stand the test of time allowing your family to enjoy your home for many years to come. The sooner you start your search for your log home plans, the sooner you will be able to enjoy all of the benefits and comforts provided by your log home. We have all the log home plans you desire plus more. Check out the log home plans we have and start envisioning the new log cabin home that even your great-great grandchildren can enjoy! This entry was posted in Log Home Plans on December 10, 2012 by HouseplanGuy. Your new log home will be one of the best investments you’ll ever make, so it’s important your log home plans are just right. Buying a home is an exciting experience. There are so many options to choose from. Is a mid-sized bungalow the best option for you? How about an old-fashioned two-story or maybe a modern split-level? Of course you can forgo the single-family home altogether and purchase a cozy condo or townhouse. Maybe the country life is more suited to you, and you would like a stone cottage. One option that is rising in popularity is the log home. Log homes have the kind of classic, rustic, all-American charm that exudes character and warmth, and never really goes out of style. A home like that is bound to be passed down through many generations of your family, which is why it’s important that you really think through your log home plans before going through with the build. Your log home plans will vary depending on a number of factors, with size being one of the more major ones. Now, it’s no secret that log homes tend to run a bit pricier than your average home. The materials cost more, and specialists who understand the construction techniques must be brought in, and all of these special considerations come with a heftier price tag. For this reason, you will want to carefully go over cost projections before you finalize your log home plans. The construction company you are working with should be able to help you calculate the potential costs based on material and labor costs per square foot, as well as any other special construction features you might be looking at adding. A beautiful log home will be far too lovely to keep to yourself, so odds are you’re planning on hosting company on a fairly regular basis. When finalizing your log home plans, make sure that you take into consideration not only your own living space, but where you will accommodate company. A large living room or great room is the perfect way to showcase the architecture of the house, and to fit in features such as a fireplace or bar. These features will give you better use of your new home, as you’ll want to show it off as often as possible! Make sure you also consider whether you need guest bedrooms and bathrooms as well. Having company over to your new log home will certainly be one of the most satisfying aspects of owning your new home. It’s going to be hard to be patient when it comes to building and moving into your brand new log home, but some things simply can not be rushed. You must make sure that you take the time to design log home plans that will fit perfectly with your needs, your lifestyle, and, of course, your budget. Solid plans will serve as the foundation for many years of happiness and enjoyment in your beautiful new log home. Log homes are beautiful, timeless, and exude a classic appeal that transcends housing trends and fads, so complete your plans wisely! If you do, you will enjoy your home for years to come. 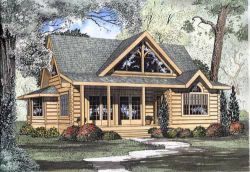 This entry was posted in Log Home Plans on September 29, 2012 by HouseplanGuy. The reasons why you should consider log home plans when designing your home. Looking at log home plans and thinking that you just don’t want a home that is so rustic? Think again. Like everything the old becomes new again and log home plans are reflecting this shift in building trends. Today’s log homes are as modern as any other homes and can be built to your specifications. Long gone are the cabin-style days of dirt floors and a singular open dusty room with very little light. Today you can choose a log home that feels luxurious, has all the amenities but is filled with old-world character and charm. So, why build a log home? Why not just go with a more modern look? Here’s why it’s worth your time investing in a log home. Log homes are built using natural materials, which provide a timeless, beautiful look and minimize your carbon footprint. Less processing of the wood and minimal shipping time makes this type of home perfect for the eco-conscious homeowner. Many construction companies build from log home plans using local timber. Logs can be dried in a kiln to remove all of the moisture or used “green” and freshly cut. Green logs used in log home plans usually take about four years to reach equilibrium with the local conditions. Your home will blend in with its natural surroundings and become one with nature. The result is a beautiful home that has been built with very little impact to the environment and it appears as though it belongs in the environment. Many people wonder if a log home will be efficient enough for the changing seasons and hold up to today’s busy demands. Most people don’t realize that log homes are extremely efficient. 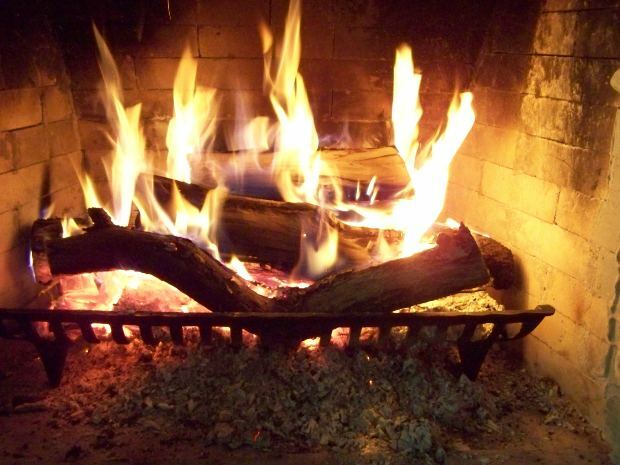 Large diameter logs retain heat well in the winter and a cozy fire place can warm the heart of your home. Logs are also very good for keeping the house cool in the summer by blocking the intense heat from the sun. Dense packed logs are an excellent sound barrier making for a very quiet home and since wood absorbs sound, moving around inside your home with a busy family will be twice as nice. Log home plans are perfect for every lifestyle. Log home plans have evolved from the simple log cabins of the past, to modern and innovative dwellings with many options and possibilities. At Monster House Plans we have so many log home plans to choose from. If you’re looking to build a simple cabin, you’ll find the perfect design and style here. If you are looking to build an ultra-modern palatial lodge, you’ll find that here too, and everything in between. Our log home plans can cater to any style or need, and for a fraction of the cost that you would pay an architect. Often, people wonder about the value of log homes. Traditionally, handcrafted log homes usually have a higher resale value than other homes of the same size. House buyers value the craftsmanship of houseplans and will pay more for the timeless beauty of a well-crafted house. This entry was posted in Log Home Plans on September 7, 2012 by HouseplanGuy.